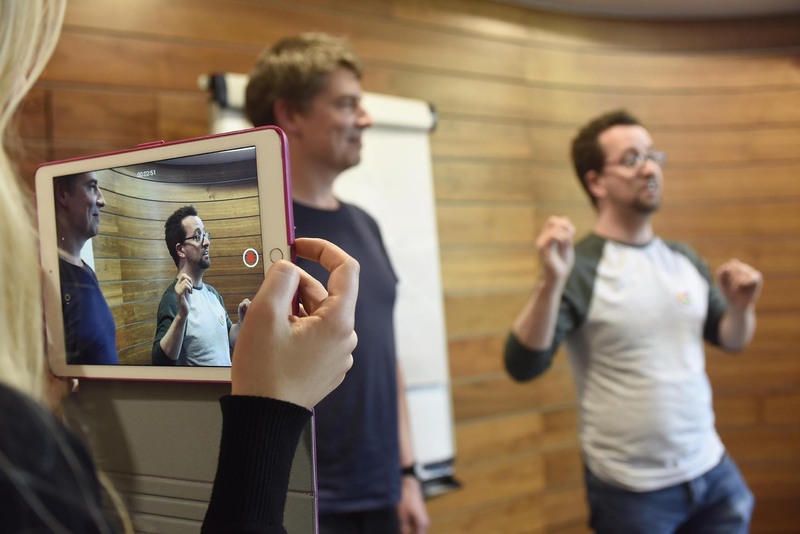 Big Stories on the Small Screen held its week-long intensive story workshop from Monday the 21st May to Friday the 25 May 2018. 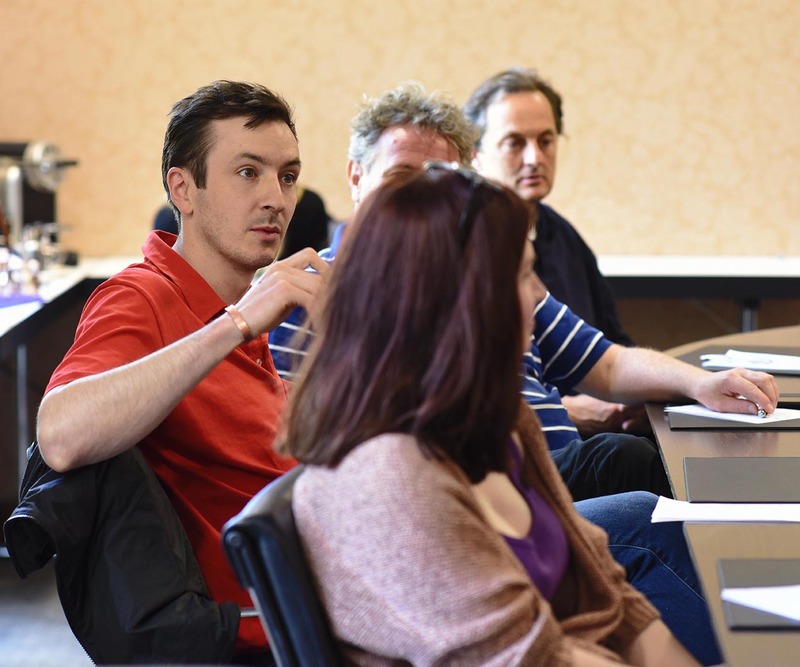 The event took the form of a week-long, project-based workshop-conference on Developing Story. It was hosted by the Radisson Blu Hotel on Golden Lane in Dublin 8. 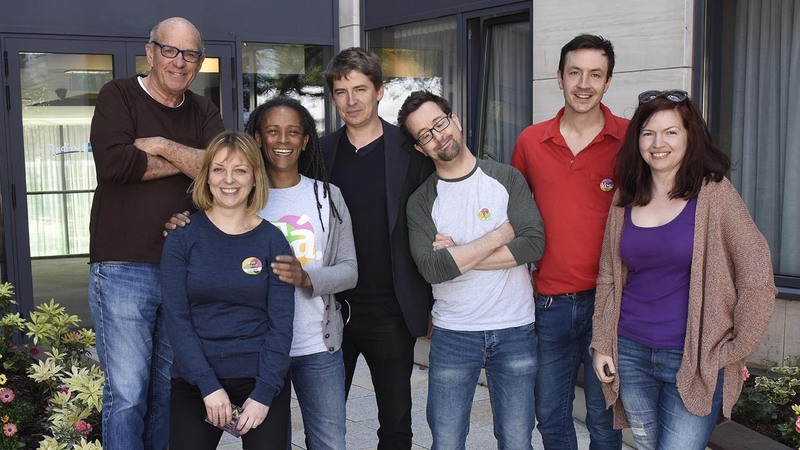 To equip a selected cohort of emerging writers, directors and producers with the key craft skills necessary to develop, structure and bring to the international media market quality Irish long-form screen stories. In so doing, to foster a collaborative approach to sectoral development, forging links between key industry stakeholders including broadcasters, public funders and industry representative organizations. The writers then broke into two writers’ rooms of five participants, each led by one tutor. The Big Stories tutors are both experienced, award-winning screenwriters who understand the dynamics of successful creative collaboration in the writers’ room setting. In addition, they both teach screenwriting at Master’s level at the University of Southern California, the ‘feeder school’ for Hollywood screenwriters. In this way, David Isaacs and Tom Abrams offered their expertise both as writers and as teachers. Their work marshalled the collaborative, creative work necessary to develop each story presented, while simultaneously developing the craft skills of the writers around their respective tables. The writers’ rooms ran for four hours, working to develop the first of their five projects. The final session of the day saw all fourteen participants engage with guest speakers from two of London’s four principal screenwriting talent agencies, Sarah Williams of Independent Talent and Charlotte Kelly of Casarotto. Sarah and Charlotte outlined the relationship between screenwriter and agent. They discussed what they look for in an emerging screenwriter, how to approach a talent agent and how to maximize the early stages of an international career. 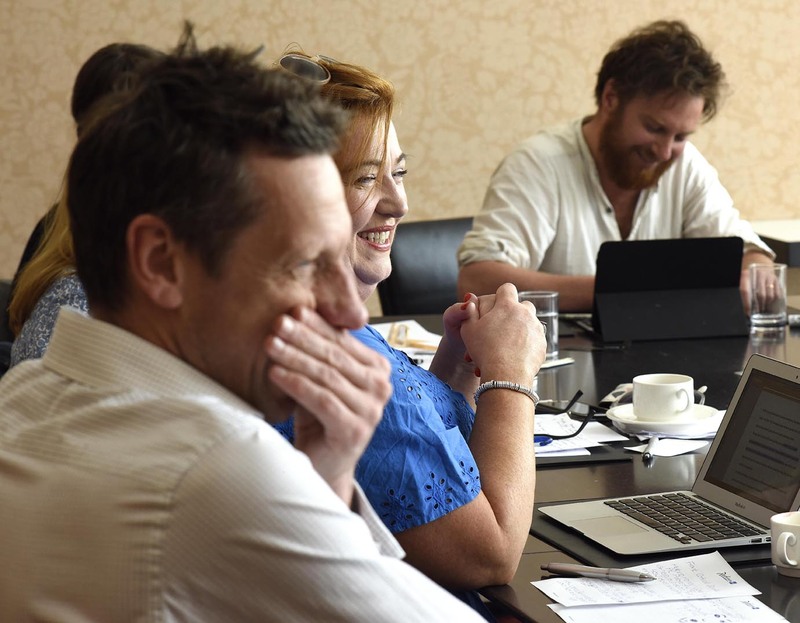 The two agents then outlined the professional landscape and conditions that structure developing, pitching and writing original television drama in the UK and internationally. Tuesday began with our two tutors running their four-hour writers’ rooms, examining the second of their five selected projects. The afternoon saw Tom Abrams screen the opening episode of Melissa Rosenberg’s Jessica Jones, conducting a detailed structural analysis of the thirteen-hour narrative. He explored thematic focus, the construction of the protagonist, the expression of theme through secondary and tertiary characters and the skilful management of audience hopes and fears. The analysis provoked a lively debate on the connection between genre, theme and characterization. Wednesday began as usual with the two tutors running their four-hour writers’ rooms, engaging with the third of their five selected projects. The keynote lecture for the week was delivered that afternoon by Paul Rutman. Paul is a BAFTA-nominated, multi-talented writer and producer. He created and wrote the acclaimed six-part terrorist thriller Next of Kin, which screened on ITV earlier this year. He created and wrote the Channel 4 series Indian Summers starring Julie Walters, as well as adapting Anne Cleves’ series of novels for ITV, Vera, starring Brenda Blethyn and now in its eighth series. In addition to our participants, this lecture was open to twenty professionals selected via CV and application through the Screen Training Ireland web portal. In interview with Irish-based screenwriter and producer Lauren Mackenzie, Paul Rutman gave an open, honest and reflective talk outlining his experience and creative approach. He discussed how to navigate the process of writing on spec versus writing to commission. He discussed his experience in receiving notes, articulating the view that often “less is more” when it comes to producers’ input into a working draft. After outlining his approach to pitching ideas, Paul discussed technical questions around the crafting of screen directions in a script, how to evoke an emotional responses in the reader and the difficulties of writing for a specific “voice” or pre-existing character. Paul was articulate on the importance of creative collaboration between the writer and the director, arguing for a close and trusting relationship between these two key creatives. He assessed his experience in working with a variety of actors, noting the importance of casting not just for performance skills but also for leadership qualities and strength of character. The afternoon’s session ended with questions from the audience around editorial control, the importance of knowing a story’s central theme and the risks and rewards of collaborative screenwriting. Thursday began with our customary four-hour writers’ rooms, comprising more intense focus and debate over the story under scrutiny. On Thursday afternoon, David Isaacs screened the opening episode of Matthew Weiner’s Mad Men. David offered insight into Weiner’s extensive level of experience as a ‘screenwriter for hire’ on dramas as diverse as Becker and The Sopranos prior to his work in making Mad Men. David then outlined in detail the creative process involved in writing the opening episode. David went on to discuss his experiences in the Mad Men writers’ room during the show’s second season, pointing up the drama’s thematic emphasis on duplicity and masquerade, as well as Matthew Weiner’s explicit thematic focus on forms of patriarchal and racial oppression. On Friday morning our final four-hour writers’ rooms took place, before an afternoon pitching session with Orlaith Carmody. This session was aimed at focussing our writers’ attention on the essential core of their project, such that they might communicate it effectively to a potential buyer. The session introduced our participants to the principles behind successfully communicating theme, tone and character, while they were still early enough in the development process to emend and sharpen these crucial founding elements. Orlaith threw the participants in at the deep end, recording them as they pitched their idea. Initially daunted, the participants engaged enthusiastically with Orlaith’s generous approach. She looked specifically at paring down their narrative to its simple, thematic core. She then shared her expertise in how to go about selling something as abstract as an idea, how to retain the interest and enthusiasm of the listener and how to avoid ‘performing’ in order to remain natural. 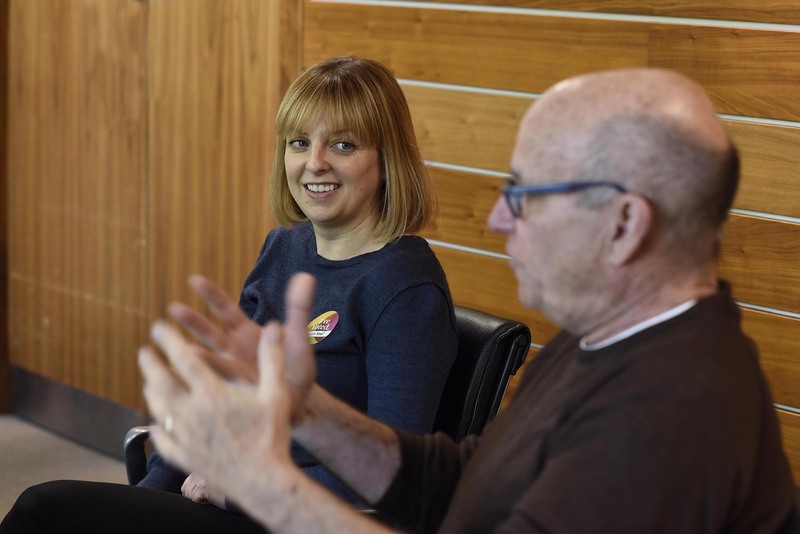 As Orlaith conducted her session, our two screenwriting tutors David Isaacs and Tom Abrams engaged in one-on-one meetings with each participant writer / creative team. 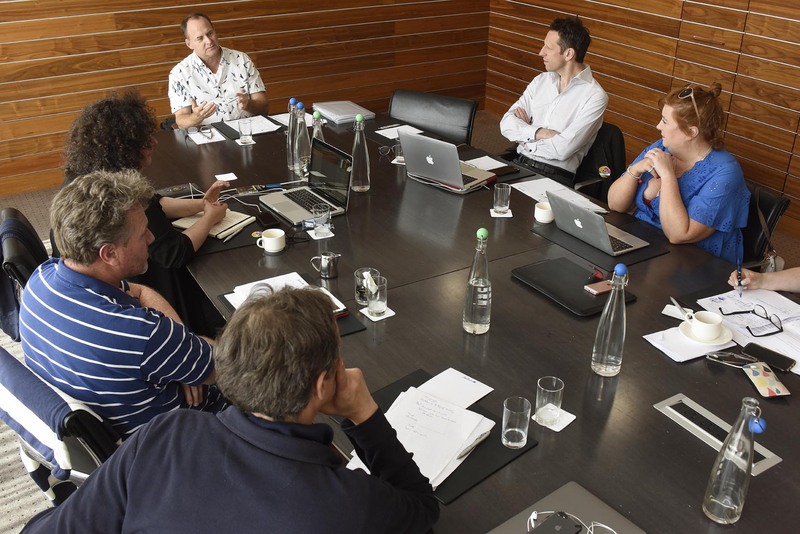 These meetings looked in depth at the results of the writers’ room session on each project, assisting the writer / creative team to organize their ideas so as to create a roadmap for the next phase of development. The week’s events ended with a round-table session with all the participants and our two tutors. Anna Merrit and Deborah Wiseman – Is This It?